Next in our series on the Blue Plaques of Primrose Hill. 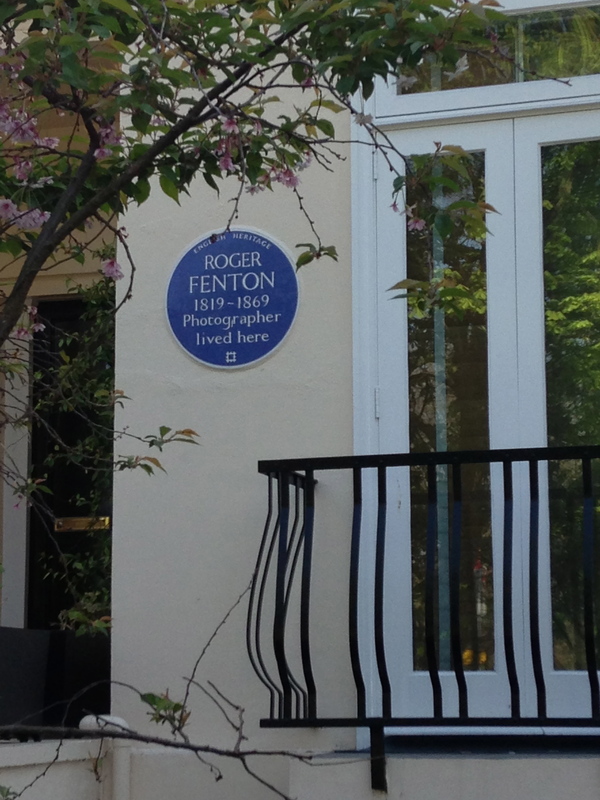 Roger Fenton (1819-1869), a pioneer of early photography, is commemorated with a plaque at his former home, 2 Albert Terrace. Born into a wealthy family – his grandfather was a cotton manufacturer and his father a banker and MP – Fenton went up to Oxford in 1838, then on graduating with a First, took up law studies at UCL. However, his passion lay with painting, which he studied in Paris and in London. His works were exhibited in 1849, 1850 and 1851 in the Royal Academy’s Summer Exhibition. However, visiting the Great Exhibition in Hyde Park in 1851, he was inspired by the photographs on display – photography in those days being a novel form of expression – and he put down his paintbrushes in favour of that new-fangled apparatus: the camera. He never looked back. In 1854, he set off for the Crimean War, in so doing becoming one of the very first war photographers. It was a tough experience: putting himself in the thick of the danger and chaos of the war, he contracted cholera, broke several ribs in a fall and became depressed at the carnage and devastation. Nonetheless, he brought home 350 images and his prints were exhibited in London and across the nation. They caused enough excitement for him to be invited to show them to Queen Victoria and Prince Albert in London, and to Napoleon III in Paris. Contemporary interest failed to translate into sales, but 150 years later his work was displayed by Tate Britain in 2005, in homage to his influential achievements. © 2013 iLovePrimroseHill.com all rights reserved.